Apollo Fruit Fusion Bulk Discount - cheaper e-liquids (5 Pack of 30ml bottles). This cheaper sampler includes five of our most popular fruit-flavored e-liquids! Watermelon: Watermelon at peak ripeness flavored e-liquid. Strawberry: Truly tastes like fresh strawberries. Enjoy a refreshing flavor with just the right touch of sweetness. Grape: Sweet grape flavor with a luscious vapor and fruity aroma. Green Apple: A juicy and crisp Green apple flavored e-liquid that is ripe with deliciousness. Hemi Orange: Sweet and citrusy orange soda flavor. I like being able to buy my e-liquid in bulk for a discounted price (Plus the additional discount makes it more appealing!). Plus I've checked out the ingredients with a pharmacists; and though nothing is good being smoked in the lungs your e-liquids are minimally harmful! one my favorite packs of e liquids. Much easier and cheaper for me to be able to mix and match different flavors and create cool and unqiue combinations. Very tasty candy like flavors. Easy on the coils and easy to vape. I don't get sick of them one bit. I could vape these all day and I truly do love all of them that come in this pack. Espcially the Green Apple. The Green apple flavor was my absolute favorite. The other ones were pretty good too but the green apple had so much flavor and did not burn out my stuff to quickly. I am going to get some more as soon as they are gonna run a sale. I agree with the other reviewers the Grape and Watermelon are also my favorite. Both of those flavors are like nothing I have ever tried before. I always recommend the Grape and Watermelon to all of my friends and family. 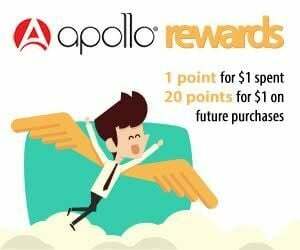 Will be a life time Apollo customer! Much easier to write reviews now that that are emailed to me. I like the fruit pack and sometimes i get the tobacco pack too. I like the Watermelon and Hemi orange the best. They taste good when I mix them together as well. I enjoy mixing and matching the flavors to make something new. I like that this pack has all of the best fruit flavors. The hemi orange I am not a huge fan of because it is not really like a fruit flavor to me. But the watermelon,straberry,apple and grape are my all time favorites. I will continue to purchase this pack. Like that it comes in the bigger size bottles. Literally every single flavor in the bulk pack I loved. The Watermelon is incredible. The grape is to die for. The green apple is subtle and tastes awesome. The Hemi orange is very unique and different but also tastes great and the strawberry is good too and very sweet. I love this pack! I love the variety of these juices. As a kid I would mix together all the sodas the restaurant had and taste it all together, which is called a suicide drink. Same with these liquids. If I want to taste caramel apple, i'll mix the RY4 and the green apple. or a menthol flavor with some kind of fruit and it makes an awesome flavor and different every time! I strawberry and watermelon. Strawberry was ok, but the watermelon was fantastic! I ordered a second bundle with all watermelon. Great flavours, Watermelon is the best! Grape and watermelon e liquids are great but didn't enjoy the strawberry one as much, it was a bit too sweet and didnt vape that well or have much flavour. It's a good sample, I think there's better but it's a great starter pack. This pack has to be the best way to go through so many fruity flavours. More than a great deal in terms of money and in finding out which of the ejuices best fit your taste. Watermelon and Green Apple are by far my favourites and will be reordered soon. Thank you Apollo for the quick delivery!